:: g r o w i n g l o b a l ::: Why, Hello Again! Well, I haven't written anything since October. This past semester ate me alive. With 20 credit hours, 2 jobs, my AmeriCorps work at the Global Refugee Center, my Soliya training, and all of the church things I'm involved in... where has the time gone?! My work at the Global Refugee Center is going amazingly well! I cannot even describe to you how much of my heart each of my little people have. 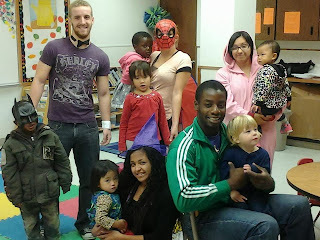 They are wonderful, special little darlings, and I adore every one of them! To the right is a picture of a few of our kiddos (Reyubeni aka Batman, Julie, Valeria, Rosemary, Sae Meh, and Lex) and some of my wonderful volunteers (Marcus, Krista, Brittany, and Martin). 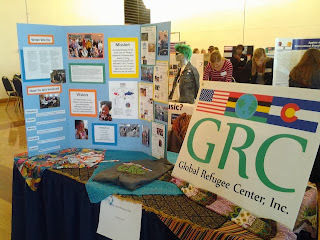 In November, I got the opportunity to represent the Global Refugee Center at the Engaged Scholars' Symposium at UNC. I was so excited and nervous about it! 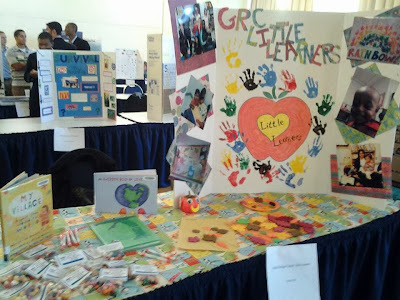 I ended up getting to have two tables side by side, one for the GRC and one featuring my project there, the Little Learners! It was such an honor to get to represent the GRC in the poster board presentation part of the symposium. If that wasn't enough, I also got to help Tsigereda, the case manager at the GRC, represent the GRC at the round table discussions. Also, I will be doing my honors' thesis as an applied project at the GRC. This is going to be a ton of work, but I am so excited for it! After attending a training session for the International Language Program, I had the idea that a method similar to the one they use might really help our beginner ESL students at the GRC. I'll post more about this topic later! In other news, I just completed my Soliya Advanced Facilitator Training. It was truly an amazing experience. This is definitely a program I believe in and fully support, and it is so great to get to be a part of it! I could be facilitating in the spring! We shall see! Last piece of news: a youth pastor of a church in the Philippines that is associated with my church contacted me recently to see if I would come to help with their youth camp! I am beyond excited for this, and I'm desperately hoping I'll be able to go! If so, I'd be there for a week in April. Hope and pray with me that it'll happen!